This is our busiest year yet and we are expanding in more ways than one. Pete and I are expecting our first little one this September and we couldn’t be more excited! 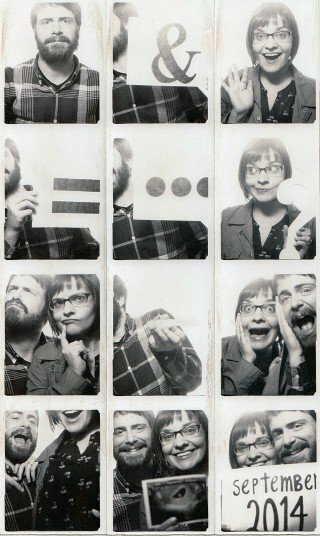 We decided to announce the pregnancy in a photobooth, since that is how Pete proposed way back when. I heard the heartbeat for the first time today and even though the wiggle worm only let me hear it for six seconds, I was instantly smitten. These days, the sun seems brighter, songs seem peppier, and food has never tasted so good. Seriously, an Olive Garden salad made me get very emotional a few weeks ago because my taste buds were in heaven. An Olive Garden salad, people. I’m nearly out of the saltine-snacking-nauseous-while-clenching-ginger-ale phase, which means my aversions to things like avocado and chicken are a thing of the past. Thank goodness. I have missed you so much, guacamole. Speaking of food (my favorite topic these days), we’re almost at week 13, which means there’s a peach-sized person in my belly. A PEACH-SIZED PERSON. I’m still not over it. I stare at the fruit/vegetable size chart on a weekly basis, in awe of how quickly these little babies grow. In an effort to avoid birthing a watermelon during a couple’s big day, I had to cancel a handful of fall weddings. I told the couples as soon as we found out we were pregnant, and I was really nervous at what the responses would be. I cannot thank you guys enough (you know who you are) for being so understanding, gracious, and supportive. I am so lucky to work with (or almost work with!) the most amazing couples. I’m so happy I could help find you replacements and that we’ve all stayed connected. In other business news, this is the last year my talented husband Pete will be joining me as my second shooter. As someone who has a full-time job, he has always been very selfless with his free time by joining forces with me during weekend weddings. Once the little one comes, he’ll be spending his weekends embracing parenthood and becoming a diaper-changing expert. Because of this, I’ll be adding some trusty second shooters to join me for 2015 weddings (and beyond)! As much as I’ll miss working with my best friend, I’m really looking forward to collaborating with other Canon-wielding friends (okay okay, or Nikon) on this exciting journey. oh my goodness. so excited for you!!!! !